Now days, GIFs are ruling on social media. People usually post GIFs to show their expressions. If you also want to get some, you can try Gimphy to search GIF images or create your own. If you want to create GIF images from YouTube videos, you can try Gif YouTube online tool. This online tool lets you quickly create GIFs images from any YouTube video just by entering URL of video. So, you do not need to download any tool for this. Just paste the link, set few options and get the GIF. Just visit the Gif YouTube. Here, you will see a big text box. Visit YouTube, search for video from which you want to create GIF. Copy the YouTube video URL and paste it to GIF YouTube text-box. And then click on Create GIF button. In few seconds, it will load the video along with few options. Add the title of the GIF, and then select the start time. You can add start time manually or select the start point on the video progress bar. After selecting the start point, select the GIF image length. Once you are done, click on Create “Gif button” to create your GIF image. 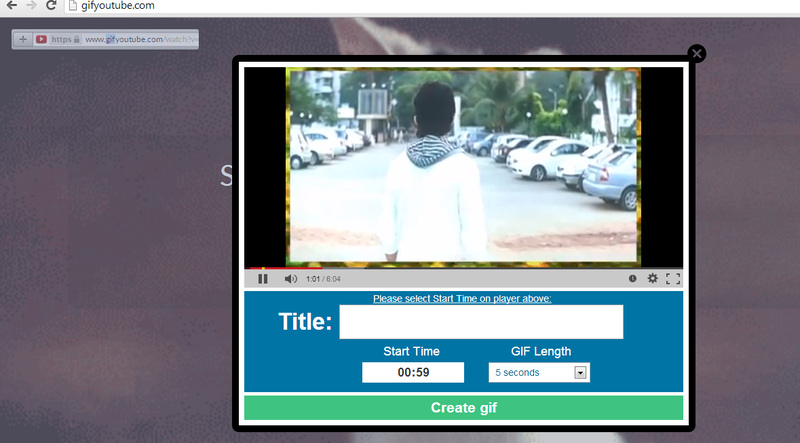 Once your GIF is ready, it will show you the URL of the GIF image along with sharing option. If you want to download this image, right click on the GIF and select “Save Image as..” from context menu. Try this nice tool and share your views about this tool with us via comments.